in accordance with my new series “the best android apps (according to me)”, i’m also starting “the best htc desire accessories (according to me)”. they’re hardly ever limited to the desire, but that’s what i use (and test) them with. 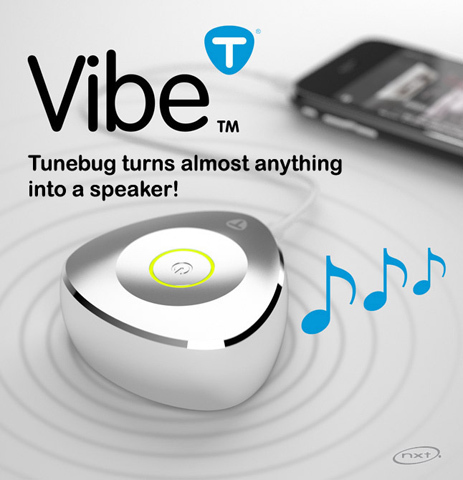 first up is the tunebug vibe: it’s a tiny, portable sound system that uses other surfaces to transmit sound. in other words, it turns almost anything – from an empty cigarette packet to your fridge – into a speaker. i didn’t expect it at first, but tunebug actually creates beautiful sound which is rich in both treble and bass. i’ve tested it with …pretty much every potential resonance body in my apartment, and outside, and it has lived up to its promises. tunebug vibe comes in a chrome finish, is compatible with every digital device that features a 3.5 mm headphone jack (such as the htc desire, htc hero, many other smartphones, and pretty much every mp3-player), and plays music for 5 hours before you need to recharge. it’s not only a cool gadget, but also a piece of applied basic physics in pure form: you probably know the changing shapes that sand grains form on a flat surface, depending on the excitation frequency. the same principle is at work when you try different sizes of boxes/surfaces and get slightly different acoustical results. the size of the box, and the position of tunebug on the box, pretty much acts as your equalizer. i’m really fond of this product! i found the tunebug vibe over at StyleMyPhone.de, who offer a wide range of iphone and smartphone accessories.